Chelsea thrashed Yeovil Town 8-0 in the Continental Tyres Cup and their quarter-final berth was confirmed when Bristol City kept up their own hopes of progress by defeating Brighton 3-0. 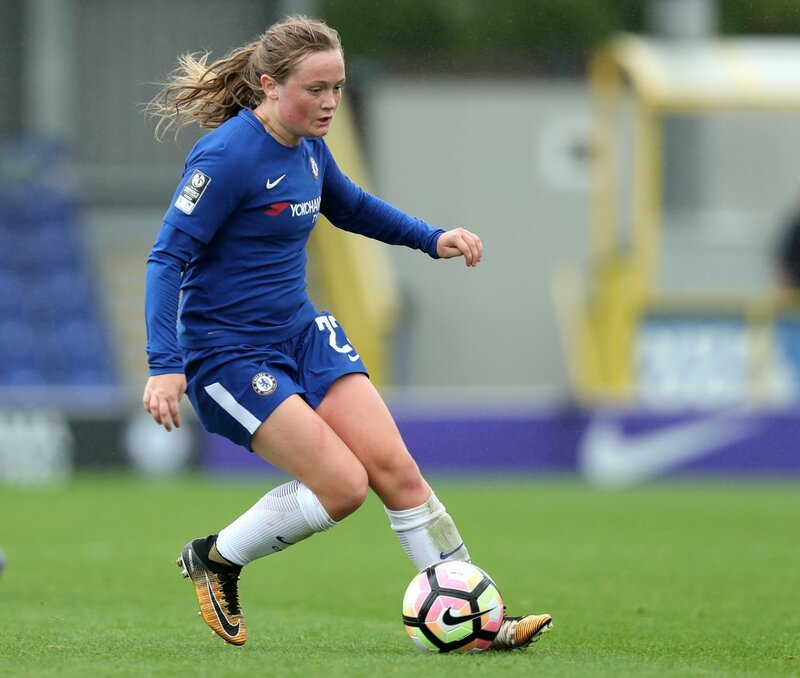 Erin Cuthbert and Drew Spence both grabbed a double as Chelsea continued their unbeaten run in the FA WSL Continental Tyres Cup with victory over Yeovil Town. Gemma Davison and Spence added two last-minute goals after Fran Kirby converted one of two penalties, contributing to the impressive 8-0 win, reports fawsl.com. The Blues wasted no time in putting pressure on the visitors and scored four times in the first half through Crystal Dunn, Cuthbert, Spence and an own goal from Nicola Cousins. Chelsea opened the scoring in the 6th minute when Eni Aluko dribbled into the box and found Dunn who tapped the ball into the back of the net. The hosts doubled their lead in the 18th minute when Ji So-Yun’s cross from inside the box bounced off Yeovil centre-back Cousins’ thigh and went into the bottom left corner of the goal. The Blues’ third goal came during first-half extra time when Cuthbert took advantage of a loose ball, firing a powerful volley into the net. And midfielder Spence scored on the stroke of half-time with a header over Yeovil keeper Megan Walsh. Cuthbert scored again in the 57th minute with an effortless finish into the bottom left corner and this time it was assisted by Ji’s through ball from outside the box. The hosts earned themselves a penalty when a miss-timed challenge from the Yeovil defence brought down Ji. Substitution Kirby stepped up and converted from the spot straight into the left corner. The Blues added two more goals to their tally in the closing as Davison and Spence were both on target from close range. Bristol City kept their hopes of a place in the Continental Tyres Cup quarter-finals alive as their 3-0 win over Brighton moved them into second place in Group Two South, on goal-difference. 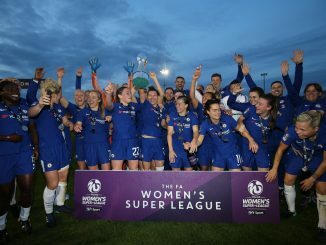 But they will have to wait until leaders Chelsea host Tottenham on Wednesday before finally finding out who progresses to the knock-out stages, reports fawsl.com. 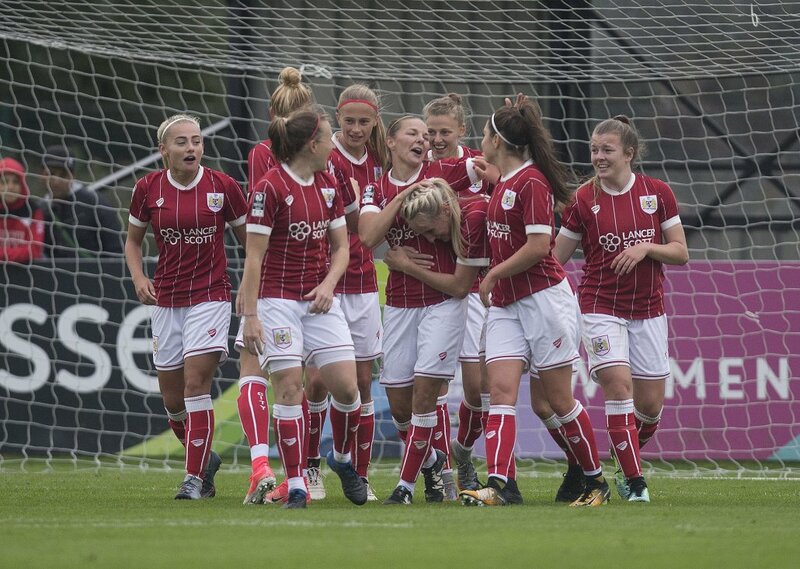 Goals from Danique Kerkdijk, Lauren Hemp and Yana Daniels gave Bristol victory over the FA Women’s Super League 2 side at the Stoke Gifford Stadium. Kerkdijk broke the deadlock in the 24th minute when Brighton keeper Lucy Gillett dropped Hemp’s lofted cross from the right and the Dutch international defender had the simple task of tapping home. 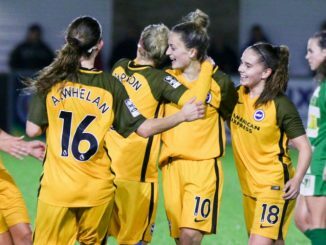 Brighton could have levelled four minutes later when Fliss Gibbons fired inches wide, but Bristol were only prevented from extending their lead by the woodwork just after the half-hour when Hemp saw her left-footed shot from 20 yards rattle an upright. The visitors also squandered a couple of opportunities in the final minute of the opening period, Iniabasi Umotong blazing an angled shot wide and Gibbons seeing her attempt fly agonisingly wide of the far post. Hemp twice caused a threat four minutes into the second half, first cutting in from the right and seeing her shot deflected for a corner, then firing over the top from the resulting flag kick. But the England youth international extended the Vixens’ lead from the penalty spot in the 54th minute, sending Gillett the wrong way with her shot after she had been brought down by Amelia Ritchie. And Daniels put the outcome beyond doubt two minutes from the end when she fired a 28-yard free-kick into the top corner.